Throughout Advent, my reflections each morning are guided by the prayer diary of the Anglican mission agency, USPG (United Society Partners in the Gospel), and the Advent and Christmas Devotional Calendar for 2018 being used in Lichfield Cathedral. If your looking for an appropriate small gift for Christmas or a stocking filler, Lichfield Cathedral Choir has released a new CD of Christmas music, In Dulci Jubilo (2018). This is a selection of festive favourites, old and new, many of them with a uniquely Lichfield twist, making this the perfect playlist for setting the Christmas mood. 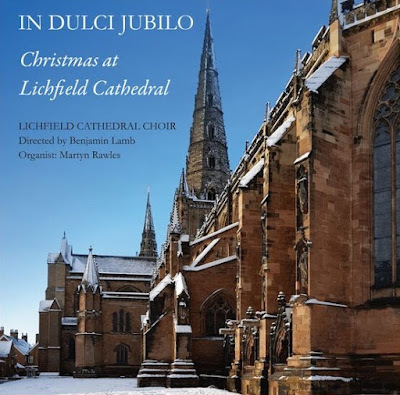 Lichfield Cathedral Choir is directed by Ben Lamb, and the organ is played by the Cathedral Organist, Martyn Rawles, and the Organ Scholar, Maksymilian Adach. This selection of Christmas music from Lichfield Cathedral, totalling 21 tracks, in recorded with VIF Records. 100 years on from the Armistice that brought an end to World War I, and so, appropriately, the central message of the CD is of peace on earth. The title track, In Dulci Jubilo, ‘In Sweet Rejoicing’ (11), is an old German carol dating back to at least the 14th century if not earlier, arranged by Benjamin Lamb, with the last verse harmony by Johann Sebastian Bach. 1, ‘Once in royal David’s city,’ treble soloists, James Sutton, Katherine Carter and Eilidh Owen. 2, ‘Hodie Christus natus est,’ Francis Poulenc. 3, ‘The Angel Gabriel’ (Basque Noel), arranged by Benjamin Lamb; trio: Robin Morton (tenor), David Werry (tenor) and Paul Whitehall (bass); organ, Maksymilian Adach. 4, ‘A Spotless Rose,’ Herbert Howells; baritone soloist, Francis Ambrose. 5, ‘O come, all ye faithful,’ melody probably by JF Wade, arranged by David Willcocks. 6, ‘A ship comes sailing onwards,’ Benjamin Lamb; soloists, James Sutton (treble); Robin Morton (tenor). 7, ‘In the bleak midwinter,’ Harold Darke; soloists, Lucy Wheat, Thomas Adams and Charlie Ward (trebles); Robin Morton (tenor). 8, ‘Lux Aurumque,’ Eric Whitacre; treble soloist, Isabella Dawson. 9, ‘O little town of Bethlehem,’ harmony by Ralph Vaughan Williams; last verse arrangement by Thomas Armstrong. 10, Organ Solo, ‘In dulci jubilo’ (BuxWV197), Dietrich Buxtehude; organ, Maksymilian Adach. 11, ‘In Dulci Jubilo,’ Old German carol, arranged by Benjamin Lamb; last verse harmony by Johann Sebastian Bach; tenor soloist, David Werry. 12, ‘Lully, lulla, thou little tiny child,’ Kenneth Leighton; treble soloist, Charlie Ward. 13, ‘God rest you merry, gentlemen!’ English traditional carol arranged by David Willcocks. 14, ‘Ding dong! Merrily on high,’ French traditional carol arranged by David Willcocks; organ, Maksymilian Adach. 15, ‘Shepherd’s pipe carol,’ John Rutter. 16, ‘As with gladness men of old,’ melody by C Kocher, adapted by WH Monk; last verse arrangement by Benjamin Lamb. 17, ‘When Jesus our Lord was born,’ Felix Mendelssoh; treble soloist, Eilidh Owen; trio, Robin Morton and Daniel Antrobus (tenors) and Nigel Argust (bass). 18, ‘Come! See the infant King,’ Disraeli Brown; baritone soloist, Francis Ambrose. 19, ‘Christmissal,’ Benjamin Lamb; bass soloist, Nigel Argust (bass). 20, ‘Hark, the herald angels sing,’ Felix Mendelssohn; last verse arrangement by Benjamin Lamb. 21, Organ Solo, ‘In dulci jubilo’ (BWV729), Johann Sebastian Bach. 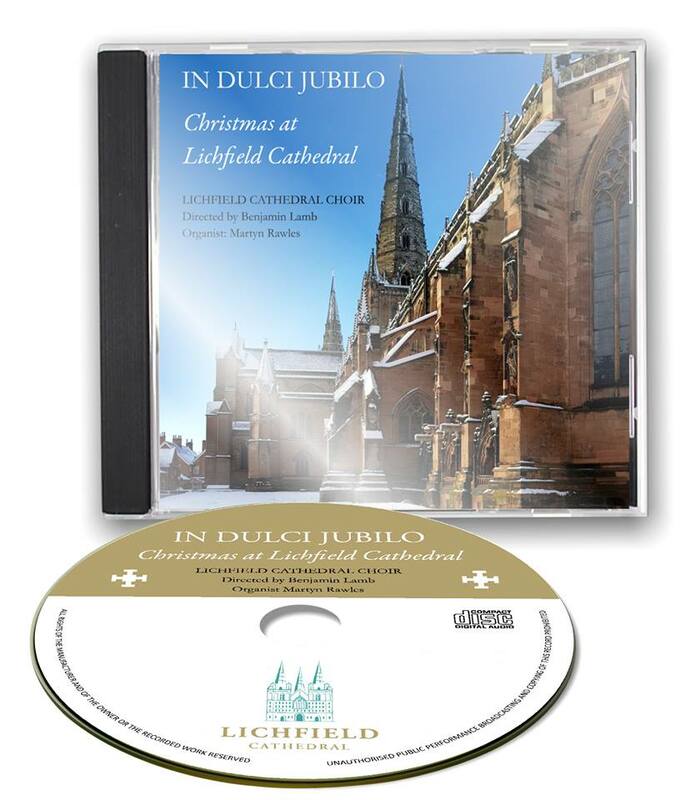 This CD was recorded in Lichfield Cathedral earlier this year, on 12-14 June 2018, by Andrew Post and Ben Lamb, and was edited by Ben Lamb and Andrew Post. The cover photograph of Lichfield Cathedral was taken during last winter’s snow in Lichfield by Steve Johnson of Lichfield Cathedral School who lives in the Cathedral Close. You can to excerpts from this new Christmas CD HERE. You can buy it HERE or in the Cathedral Gift Shop. Cost £14 + £2.50 p&p for each order. All the proceeds from the sale of the CD go to support the Choir Projects Fund.